This article is about the Nintendo console. For the treasure from Wario World, see here. The Nintendo 64 (codenamed "Project Reality"; sometimes referred as the "N64"; parsed on the logo as "NINTENDO®64") is a video game console created by Nintendo. It was released in 1996 to compete with the Sega Saturn and the Sony PlayStation. Despite not beating the PlayStation's sales, the Nintendo 64 was still largely successful for many reasons, one of the big ones being the release of Super Mario 64. Super Mario 64 was one of the first games of its kind to feature full 3D graphics and depth of field effects. The Nintendo 64 was able to pull this off because it was the first system to feature a 64-bit processor and 32-bit graphics chip (aside from the failed Atari Jaguar, which was really multiple co-processors using 64 bit architecture on a 32-bit main processor). The Nintendo 64 also featured the first successful analog control stick implementation and four built-in controller ports, unlike its competitors, the PlayStation and the Sega Saturn. 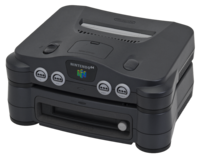 The Nintendo 64 is also noted as the last home console system to use cartridges until the Nintendo Switch. Nintendo started using discs like its competitors and the canceled "SNES CD" add-on, starting with the Nintendo GameCube. The Nintendo 64 hosts a wide variety of games, but most of its hits are first-party titles such as Super Mario 64, Super Smash Bros., Mario Kart 64, Mario Party, Paper Mario, Star Fox 64, The Legend of Zelda: Ocarina of Time, and F-Zero X. Rareware, however, developed quite a few hits for the N64, such as GoldenEye 007, Banjo-Kazooie, and Donkey Kong 64. Production of the N64 ended in 2002. The Nintendo 64 sold 32.93 million units during its lifetime. In 1999, Nintendo released the Nintendo 64DD. The "DD" in Nintendo 64DD stood for "disk drive", and originally "dynamic drive". An add-on device for the Nintendo 64, it was a machine that allowed games to be played in a disk format, similar to zip disks. These were intended as a cheaper version of the Sega Saturn's game disks and the PlayStation's, but the Nintendo 64DD ended up being a commercial failure due to the way it was sold and was never released outside Japan. In total, four Mario games were released on the 64DD, all in the Mario Artist series. In 2003, the so-called iQue Player was released in the Chinese market only, serving as the Chinese equivalent of the Nintendo 64, albeit with a differently designed controller. Its D-Pad and analog stick are placed as on the Nintendo GameCube controller. The entire system only consists of the controller, which has the chip on-board. It has a limited selection of Mario titles, all of which were released for the Nintendo 64 outside China. These include Super Mario 64, Mario Kart 64, Paper Mario, Yoshi's Story, Dr. Mario 64, and Super Smash Bros. The original Nintendo 64, and its six controller colors. The Nintendo 64 Controller is the standard controller for the Nintendo 64. It is unique among video game controllers, as it has three grips instead of the more common two, resembling the letter M, most likely done because Nintendo was worried that 3D gaming wouldn't catch on, so they made a separate grip for the Control Pad. There are many color variations of the controllers, including solid colors and clear colors, the many different colored controllers being a unique concept at the time. 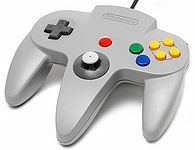 Contrary to popular belief, the Nintendo 64 is not the first console to use analog control sticks; it is just the first successful console to use them. The Vectrex was the first home console to have an analog stick; it also had four controller ports, something else that wasn't popularized until the Nintendo 64. The Nintendo 64 Controller, the standard controller for playing Nintendo 64 games. Although not required like its competitor, the PlayStation, some games utilized external storage by the use of the Controller Pak, such as Mario Kart 64 and saving ghost times. This allowed Game Boy and Game Boy Color games to connect to select Nintendo 64 games. It was bundled with Pokémon Stadium, although Mario Golf (Nintendo 64) and Mario Tennis (Nintendo 64) were possible to connect with Mario Golf (Game Boy Color) and Mario Tennis (Game Boy Color) respectively. Interestingly, the Game Boy Camera is the only Game Boy game to connect with a Nintendo 64DD game; Mario Artist: Paint Studio. Bundled with Star Fox 64, this made the Nintendo 64 the first home console to utilize force-feedback vibration and has since become standard in gaming. Almost all Mario games included it as something it could use. Super Mario 64 initially didn't have Rumble Pak support but later Super Mario 64: Shindō Pack Taiō Version was released. This accessory was only commercially available in Japan and was a failure, although it was planned for an international release. Only 4 Mario games were released for it, all in the Mario Artist series. In Donkey Kong Country 3: Dixie Kong's Double Trouble, Wrinkly Kong plays on a Nintendo 64 in Wrinkly's Save Cave. In Yoshi Story, a Nintendo 64 can be seen in the backgrounds of a few levels. In Super Smash Bros. Melee in the background of the stand where all of the player's trophies are, a Nintendo 64 with the controller and the Super Smash Bros. game cartridge and box appear on a shelf, along with various other Nintendo systems. In Wario World, a Nintendo 64 appears as a treasure. In Super Paper Mario, in one of Francis's rooms, a Nintendo 64 can be seen alongside the other Nintendo platforms released by that time, as well as a Virtual Boy. In Super Smash Bros. Brawl, one of the names that can appear whenever a player presses the random button when they're naming their custom stage is N64, which is a reference to the old system. Guinness World Records 2011 Gamer's Edition states that Super Mario Bros. was ported to the Nintendo 64, which is false. Several Nintendo 64 games depict the cartridges with a different artwork than their corresponding box art (e.g. Super Mario 64, Mario Kart 64, Donkey Kong 64, etc). In Japan, the Nintendo 64 was discontinued before the Super Famicom. Super Mario 64 helped to define the layout of the N64 controller: The analog stick and Buttons respectively being incorporated for better movement in a 3D environment and better free-camera control. There is a difference in the PAL version of the Nintendo 64 in that it runs on 25 fps and 50 Hz as opposed to the 30 fps and 60 Hz of the NTSC and Japanese versions. Because of this, the PAL version has a slower frame rate and lower-pitched audio. This was the first Nintendo home console to use the same name and design between international and Japan. This page was last edited on April 19, 2019, at 09:08.